Hey guys! Nop, we haven’t disappeared, we’ve been busy preparing for our next show and running workshops! Join us on FRIDAY 9TH MARCH 2018 for a Women in Research special Bright Club show 🙂 We will be at the same place as before, 104 Kitchen & Cocktail Lounge, doors will open at 6:30 pm and the show starts at 7 pm. The show will be hosted by Sarah Benetto and headlined by Lou Sanders. Tickets are on sale here and follow us on Facebook for more info. Look forward to seeing you there! No. 10 – the Christmas Show! 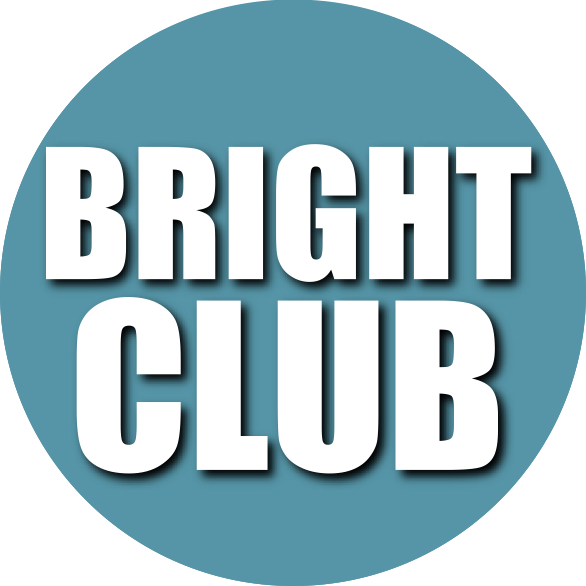 Please join us next week for Bright Club No. 10 – our 2017 Christmas Show! Five hilarious researchers will once again be taking the stage to share their comedic genius. Tiernan Douieb will be your host and Adele Cliff will headline! ~Tickets: £6.50. Purchased here to guarantee a seat, or at the door. We cant wait to see you there!! No. 9! Come and gone but not too late to watch! Last week we had an amazing show featuring the talents of Alex Farrow and Samantha Baines, as well as five hilarious researchers: Les Carr, Lisa Jones, Jamal Kinsella, Dave Christensen, and Grace Andrews. Click here to get the details about the acts and the performers, and see photos. Have you ever come away from one of our shows and thought “Oooh, I’d love to know more about the work that they were doing!”? Well, the podcasts are a chance to do just that! Each episode is an interview with a performer, you can hear about their career, life as a researcher and the work they get up to! Today is #InternationalWomensDay so first up we’ve got Jess Spurrell who performed at our very first show! Bright Club Southampton is actually her baby, she founded it! Jess works in cryogenics and in her spare time she does ALL SORTS of public engagement and won the #WiSET award in 2016! You can follow her on Twitter @HungryWomenBlog and read her blog at www.femmesavecfaim.blogspot.co.uk! There are plenty of things happening to celebrate #IWD, check out https://www.facebook.com/SotonIWD/ to see whats happening. Our podcasts can be found on our SoundCloud, so go ahead and check it out! Although we’ve not been able to make many blog posts, we’re still running shows every quarter! We just had our 7th show on Friday 24th February, so go have a look at the photos from the show and check out our YouTube channel to see how the performers did! Roll up, roll up for Bright Club’s 6th show on Friday 18th November!! You know the details – Boulangerie Victor Hugo, doors 6.30pm. Get yourself excited for the next show coming soon – FRIDAY 18TH NOVEMBER at the wonderful Boulangerie Victor Hugo Southampton 🙂 use the link below to see our facebook event page and follow the link to the ticket page!